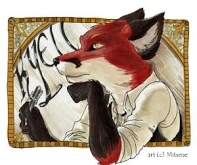 Kyell Gold began writing furry fiction a long, long time ago. In the early days of the 21st century, he got up the courage to write some gay furry romance, first publishing his story “The Prisoner’s Release” in Sofawolf Press’s adult magazine Heat. That led to a novel, Volle, and a sequel, Pendant of Fortune, followed by two novels in a contemporary world: Waterways and Out of Position. In 2010, he released both Shadow of the Father, which takes place in the world of Volle, and Bridges, a short novel about the building and breaking of relationships and the first in a series of short fiction works called Cupcakes, which he is writing with Rikoshi and foozzzball. Other strange things he likes to write about include mystical decks of cards, superheroes, and sports. He was not born in California, but now considers it his home. He loves to travel and dine out with his partner of many years, Kit Silver, and can be seen at furry conventions in California, around the country, and abroad. With his friend K.M. Hirosaki, he hosts a podcast about writing called “Unsheathed,” produced by Kit, and although Kit and K.M. both enjoy a glass of wine, Kyell prefers Coke Zero to fuel his podcasting and writing.